This is a wonderful dish to serve as a first course before dinner or as an appetizer for a cocktail party. I would serve this with a nice bottle of Pinot Gris, it would be a perfect pairing! I love when fava beans come into season. They are at their best right now, so tender and sweet! The only problem with fresh fava beans is that they are a bit of a pain to peel because you have to do it twice. But it's worth it in the end because they are delicious and good for you too! Pre-heat oven to 350 degrees. Cut garlic bulb in half, drizzle each half with olive oil, salt and pepper and wrap loosely in foil. Bake in the oven for 45 minutes until soft and slightly caramelized. Let cool and squeeze out roasted garlic from shell, set aside. Slice bread, brush each side with olive oil and sprinkle with salt and pepper. Place on a sheet tray and bake in the oven for 8 minutes on each side until slightly crispy. Remove fava beans from pod, and place in boiling water for about 1 minute or so. They cook really quick and can go from bright green to army green in a matter of a couple minutes. Remove from water and place in an ice bath to stop cooking. Drain beans and remove the skin/peel. Place fava beans in a food processor, add 4 cloves of the roasted garlic and the juice of 1 lemon or to taste. Pulse until mixture starts to form a puree, scraping down the sides. Drizzle in a little olive oil until desired consistency and add salt and pepper to taste. Drain oil from sun-dried tomatoes, finely dice and place in a bowl. Add minced capers, minced garlic, minced tarragon, lemon zest and the juice of 1/2 lemon or to taste. Mix together and season with salt and pepper and set aside. Spread a really thin layer of roasted garlic on the toasted bread. 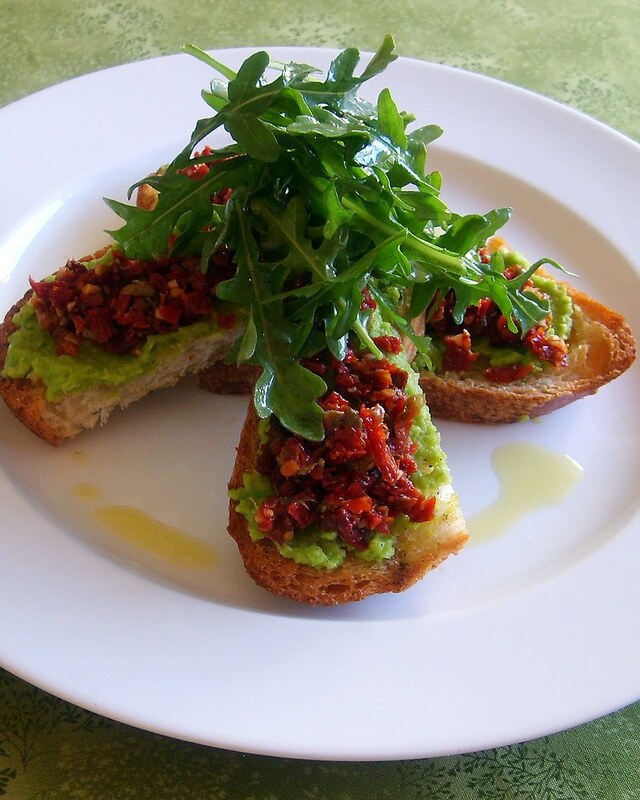 Top with each piece with 1 tbsp of fava bean puree and 1 tbsp of sun-dried tomato tapenade. Cut bread in half on a bias. Mix arugula with a little lemon juice, olive oil, salt and pepper and place on top of bruschetta slices and serve!